Gravitational force is one of the fundamental and weakest force of the nature and it exists between every two bodies as every body is having some masses. 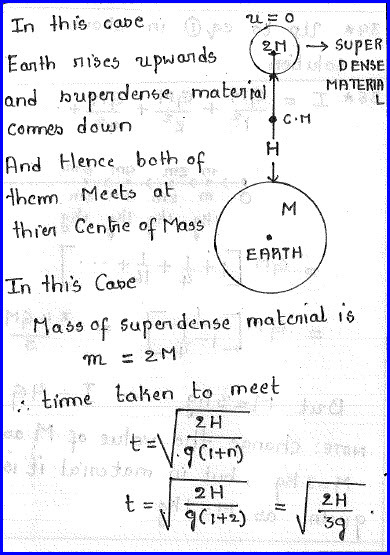 Gravitational force is due to the mass of the bodies and it is independent of the medium. It is a long distance ranged force and it acts between the particles separated by a very large distance. When compared with electromagnetic and nuclear force, it is just minimum and it gives the stability to the system. The earth is revolving around the sun due to this gravitational force and it acts like the centripetal force. We are solving series of problems on this topic and this post is the third one in the series. We would like to find the acceleration due to gravity of the earth at a height equal to half the radius of the earth above the earth. Problem is as shown in the diagram below. 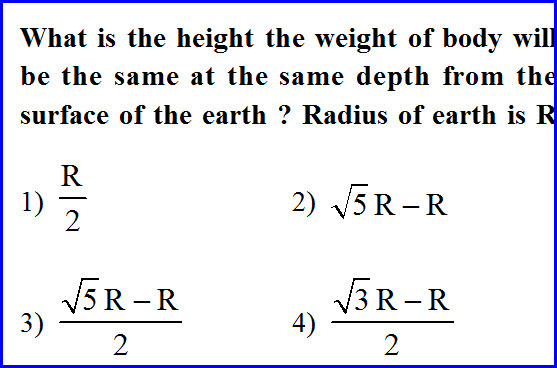 While solving this case, approximation can not be applied as the height is significant when compared with the radius of the earth. 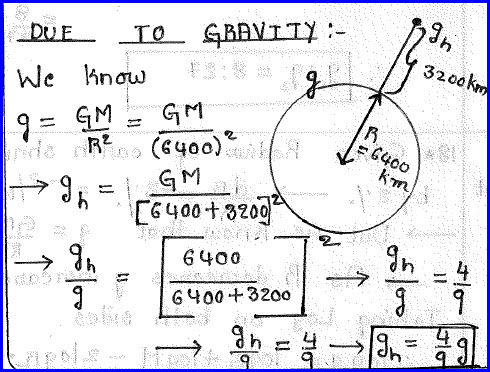 By applying the newton's law of gravitation, we can find the gravity at a given height as shown in the diagram below. 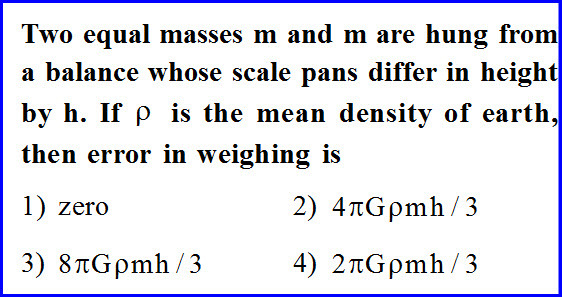 Two equal masses are hung from a balance whose scale pans differ in height by h. If density of the earth is given to us, we need to find the error in the weighting. Problem is as shown in the diagram below. 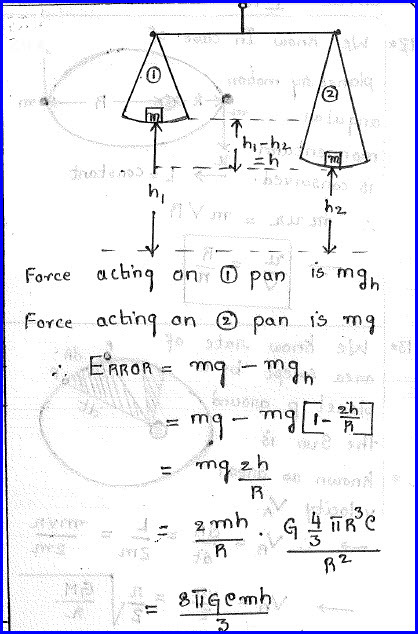 It is shown in the diagram that from the reference point, both the pans are at different heights and hence they have a difference in the heights as given in the problem. Error in the reading is the difference in its weights. 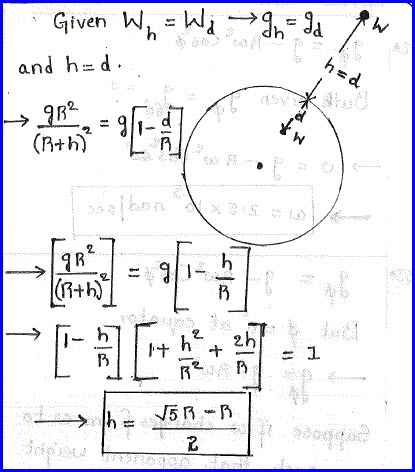 Variation of heights is small and hence approximation can be applied and the problem can be solved as shown in the diagram below. 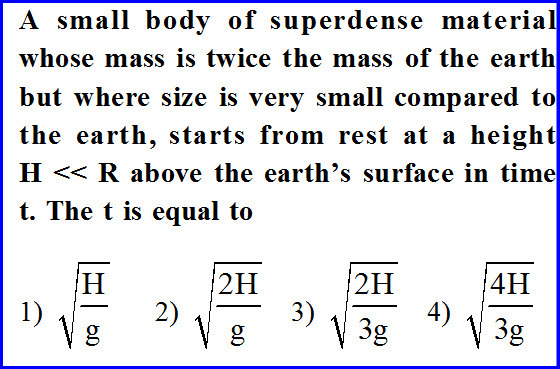 A small body of super dense material whose mass is twice the mass of the earth but size is very small when compared with the earth. If it starts from the state of rest, we need to know its location after a specified time. The problem is as shown in the diagram below. For every action there is equal and opposite reaction. As the body comes downward, the earth moves upward. The two meet at the center of mass of the system. We can further solve the problem as shown in the diagram below. We need to find the height from the surface of the earth where weight of the body is similar to the weight at a depth from the surface of the earth. Problem is as shown in the diagram below. We need to apply the formula for the acceleration due to gravity at a height and at a depth and we need to just equate both of them. The problem is as shown in the diagram below. We need to find how fast the earth has to rotate so that apparent weight of a body becomes zero at the equator. Problem is as shown in the diagram below. We know how acceleration due to gravity varies with latitude. We know that at equator it is minimum and as we are moving to wards poles, it becomes maximum. 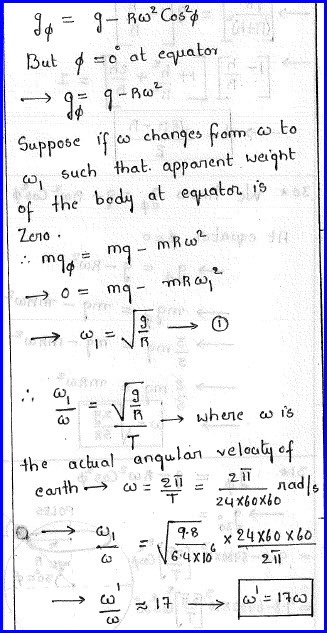 By writing the formula at the equator and further equating weight at that point zero, we can find the angular velocity as seventeen times the normal velocity and the detailed solution is as shown in the diagram below.